If you are looking for qualitative marketing data to connect with C-Level Executives who hold the decision making authority in their organizations then, Blue Mail Media is here to help you. Whether you wish to connect with CEOs, CIOs, CFOs, CTOs, CMOs, CSOs or any other C-Level Executives, our database of C-Level Professionals gives you highly accurate data to reach your prospects via telephone, email or mail. Reaching these executives with our C-Level Executives Email Database is a lot easier and time saving as you do not have to pass through multiple gateways of communication to put your message across to them. Blue Mail Media has a widespread network of data partners spread across USA, UK, Canada, Europe, North America, APAC and other major parts of the world. This enables us to serve clients with a global yet local approach. Our team of data scientists, subject matter experts, and professionals follow a stringent process of data collection, verification and update. Not only we acquire data from authentic sources, but we also conduct quality checks on a timely basis to ensure our data remains free of redundancies. Our C-Level Executives Database gives you all the information you may need to execute your multi-channel marketing strategies. We also understand that your data needs might be different from other organizations, and thus, we provide pre-packaged as well as customized C-Level Executives Email Addresses that aligns perfectly with your marketing specific objectives. 1. How accurate is your C-Level Executives Email List? - Our C-Level Executives Email List is highly reliable as it offers 85-90% of accuracy and above 90% deliverability rate. Our team of specialists invests significant time and effort to provide you with such precision. They make thousands of verification calls and send more than 8 million verification emails to keep the database free from errors and redundancies. 2. Does your C-Level Executives Mailing List offer customization option? - Yes. We provide customization option for our C-Level Executives Email List. It is made available in both prepackaged and customized format for your benefit. You can easily segment the data present in our list based on your business requirements such as SIC code, NAICS code, location, company’s revenue, job title, and more. 3. Can we target both local and global industries using your C-Level Executives Mailing List? - Yes. Our C-Level Executives Email List is capable of helping you reach the prospects all around the globe quickly. It covers the data of decision-makers and professionals from various parts of the world. The areas include the US, the UK, North America, Canada, Europe, Australia, Middle East, South Africa, Asia, and many. 4. 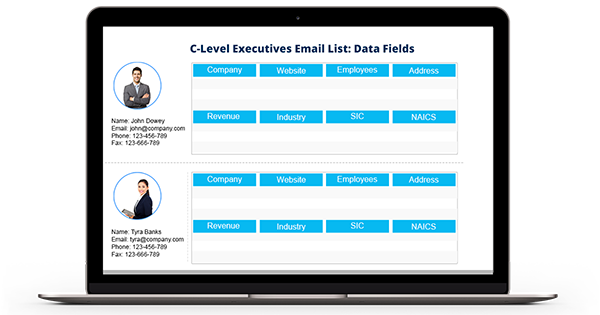 Is all the data source you rely on for your C-Level Executives Email Database trustworthy? - Yes. You can have complete faith in the data we offer in our C-Level Executives Email List. It is because we gather them only from highly authentic and internationally reliable sources. It includes surveys, corporate websites, government records, trade shows, yellow pages, business directories, conferences, meetings, and many. 5. Do you provide all the required information of prospects in your C-Level Executives Email Database? - Yes. Our C-Level Executives Email List gives you access to all the essential B2B marketing information for campaign execution. It includes- first name, last name, location, web address, company, phone number, job title, revenue, company size, SIC code, NAICS code, and more. 6. Does your C-Level Executives List comply with GDPR and Anti-Spam law? - Yes. Our team carefully designed this C-Level Executives Email List to stay compliant with the guidelines of GDPR and Anti-Spam law. So you don't have to fear about its legitimacy. 7. In which format will I get my C-Level Executives Mailing List? - After the completion of the payment, we will email you the C-Level Executives Email List in Microsoft Excel format.